It has been absolutely gorgeous around here. The nights and mornings are now cool and the afternoons near perfect. No shortie wetsuit needed for my paddleboard excursions. If this weather keeps up Santa will be wearing shorts and a tank top! I’m loving it! Alicia says that predictions have us enjoying this weather until the end of December. What will that mean for next summer? I guess we’ll deal with that next year. Hope all of you have a fantastic start to the New Year! It seems I completely missed our 25th Anniversary last month. Hard to believe the paper has been around for 25 years. That’s more than half my life and I’ve been in Rocky Point for darn near that. Wow! A lot of you have also been with us since the very beginning and we owe a huge part of our success and longevity to all to you, our readers, our writers and our advertisers. Without you guys there would be no paper. Well, maybe there would be, but it would be awfully boring. To everyone who has contributed to the Rocky Point Times over the years, we would like to send you a BIG THANK YOU. Speaking of Thank You…Mark Mulligan’s new CD, “Same Beer Different Can” came out shortly after we saw him play on our trip to San Carlos. He sang a song from his CD titled “Thank You” and it is just a great song. Reminds me of everyone who has supported us throughout the years so that we can continue to do what we love. Grab your copy of Mark’s new CD at www.markmulligan.net. By the time you read this we will most likely be at Hacienda de Los Santos in Alamos with a bus load of people and Mark Mulligan. It’s a fantastic trip that happens twice a year. The December trip is wonderful because everything is decorated, which makes the town even more beautiful. And we get to take part in the festival downtown complete with food, shopping, music, fireworks, carnival rides and fun. You can find out more about these trips on his website as well. The holiday season is a very busy time around town and a great time to come down to visit. Where else will you be able to find gifts that aren’t available anywhere else in the world? Shop around Old Port, Rodeo Drive as well as the Mermaid’s Market for holiday gifts. And check out our advertisers for unique gifts and gift cards. And many restaurants and cantinas offer gift certificates: What could be better than that except for maybe a gift subscription to the Rocky Point Times Newspaper (wink*wink*). Christmastime always sees lots of charitable events and charities raising money for such events. 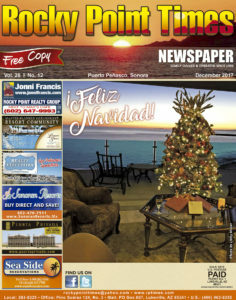 You can find a pretty complete list in this, and every issue, of the Rocky Point Times. And for up-to-the-minute events, charities in needs, things to do, etc. check out our Facebook Page. If you want to donate to a specific cause you can always hit us up at the office for some suggestions. If you want to get involved and help out don’t be discouraged if you don’t speak Spanish as it seems there is always someone around that speaks at least a little bit of English. And helping out and being charitable seems to be an international language of its own. There are also lots of great articles by our contributing writers that highlight their favorite local charities. A tidbit that may be interesting to those of you who travel through Mexico…Uber is now operating in Nogales, San Luis Rio Colorado, Guaymas and Navojoa. They operate in other cities as well, but these have just been added. I often use Uber when I stay in Hermosillo and it works just like in the U.S. and is super easy and convenient. I’m not sure if Uber will be coming to Rocky Point any time soon, but our local cabbies are everywhere and many of them with new cars. If you’re looking to spend New Year’s Eve here in Rocky Point be sure you make your entertainment/dining reservations as soon as you read this! Hopefully your favorite restaurant/cantina still has space open. We’ve seen an increase in tourism all year which naturally means more of you want to ring in the New Year in this awesome town. Have a fun and safe night and be sure to call a taxi or have a designated driver! On a totally unrelated subject, if any of you out there have an idea for a beach item, or an idea on how to better a beach item (chair, cooler, umbrella, etc.) and want absolutely zero, zip, nada for it, send us an email with your idea. I will explain at some later date, but for now have to keep it on the DL (down low for you non-smart-phone people like Sandy). I mean…you won’t get zero, zip, nada for it, we’ll probably load you up with free stuff. Hopefully early next year I’ll be bringing you some Editorials from Mexico’s wine country and we will have some progress to report on our new Home Port. 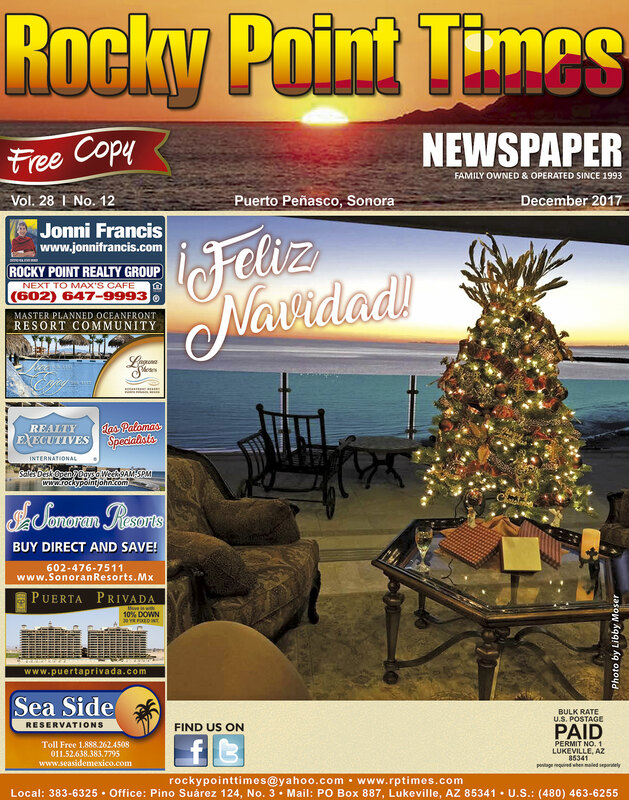 Sandy, Alicia, Myself and Mario would all like to wish you a very Merry Christmas and a very Happy New Year, 2018 is destined to be a stellar year in Puerto Peñasco!